Editor's note: We are so, so, so excited about our first guest blogger of the season, Casey. Before I had the pleasure of getting to know Casey, I always admired her style from afar. She reads just about everything that is posted on this blog and has always been supportive of me and Ashton in everything we do. All in all, Casey is the best. Enjoy! First and foremost, as I write this out, it is currently something along the lines of negative zero degrees outside. In order to stay warm and still avoid looking like the Stay-Puft Marshmallow from Ghostbusters, this Moncler parka is high on the want list. For those of you who know me well, and I’d imagine few of you reading this do, black is typically my color of choice. It goes with everything, you can use fun colorful accessories to add a pop of color, and there is that whole thing of being universally slimming. However, I have chosen this coat in the deep wine color. Still timeless, still classic...and of course fierce. 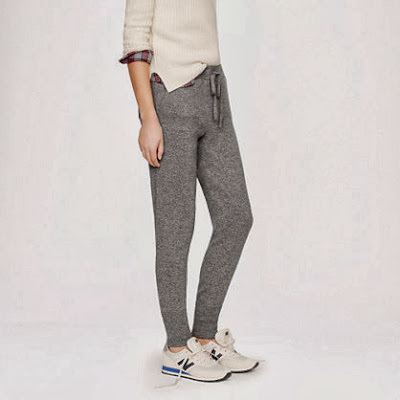 Moving right along on the theme of keeping warm and to add that I have memorized the entire J.Crew Holiday catalog, the item most desired by me has to be the cashmere leggings. We all know winter is about hibernating at home, but why should this mean you are stuck in some drabby pajamas? J.Crew knows how to elevate loungewear to the highest degree when they came out with these bad boys. Next on my list are the Nike Pro Safari Moves tights. This summer I developed a very (unhealthy) addiction to spinning at a place called Flywheel. Yes, this is a very healthy addiction...I mean working out...burning like 800 calories can’t be a bad thing. However, this also means a whole new area of clothing and accessories are vital. I was all in on Lululemon until I spotted these bad boys. I need them...I want them...I must have them. I have always had an affinity for things with skulls. I used to have a sickening Toy Watch with a skull on the face, however it broke and I could never find a replacement. It wasn’t until I saw the Alexander McQueen skull smoking slippers, that I was finally able to move past the watch. There’s something incredibly sophisticated about a pair of velvet smoking slippers, but when you add the skulls it takes it to a whole new level. And finally...there is nothing I want more than a Missoni throw blanket. I know...how shallow of me...but I can’t deny it. I see anything with the signature chevron print and I’m all in. This blanket has been on my most wanted list for years but it has moved to the most most wanted after seeing Rachel Zoe’s home decked out in the prints. My dream home would be simply black and white with touches of Missoni sprinkled throughout. This blanket is only the beginning. Give us 'like' on Facebook and a 'follow' on Twitter. There are more wish lists to come. Stay tuned.